[[AirTran]] announced last week that it will begin selling business-class upgrades onboard its planes, meaning folks in coach can move up to business if the mood strikes them and there are business seats available. Upgrades range from $49 to $99, depending on the length of the flight, and will be available on a first-come-first-served basis. To say this is both a welcome idea and a shrewd business move would be an understatement. After all, who among us hasn’t gazed longingly at those expansive, plush business-class seats while marching to the crowded cacophony of coach? That’s exactly what AirTran is betting on, that you’ll be enchanted enough by the sight of its business-class seats to upgrade to one onboard. Previously, you could only upgrade before flying, and even then only from a full-fare (Y class) coach ticket, which is the most expensive coach ticket AirTran sells. For example, I searched a random flight and date—Boston to Milwaukee in mid-November—and found full-fare refundable coach tickets were almost $300 more than a nonrefundable “Web Special” fare. Boston to Baltimore: Web Special ($59) plus upgrade ($49) totals $108; business-class ticket costs $299. Boston to Ft. Myers: Web Special ($84) plus upgrade ($69) totals $153; business-class ticket costs $519. Atlanta to Denver: Web Special ($119) plus upgrade ($99) totals $218; business-class ticket costs $442. This is a small sample, of course, but clearly onboard upgrades are a slam dunk for folks flying on AirTran’s cheapest fares. With more expensive tickets, however, you may end up paying more in total than you would by booking a business-class seat from the get-go. Keep in mind, too, that upgrading to a business-class seat requires at least one empty business-class seat on your plane, which is far from guaranteed, especially as we approach the busy holiday season. So don’t board the plane fully expecting to snag an upgrade. For most passengers, upgrading to a spacious business-class seat is worth paying a little extra. 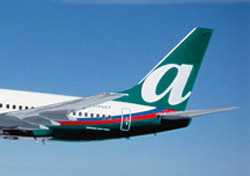 At no more than $99 bucks, AirTran’s new program gives you that option without hitting your wallet too hard. And even if shelling out some extra cash onboard makes you uneasy, after a few free cocktails, you may not even remember how much you paid.